CHARLESTON, W.Va. — Schools across West Virginia reopened Wednesday as families got back into their daily routines following a nine-day teacher strike. The strike was declared over Tuesday after the Legislature passed and the governor signed a 5 percent pay raise to end what’s believed to be the longest strike in state history. The last major strike, in 1990, lasted eight days. Now the state’s 35,000 public school employees are back to work — and 277,000 students back to their books. At schools across the state, school buses and long lines of cars dropped off children, who were a bit slow afoot to get inside despite snow flurries in the air. But in a way, it had the feeling of the end of summer vacation as families try to adjust to a new, yet old, routine, especially not being able to sleep in. “I feel really good today that school has re-started and I think the teachers had every right to do the strike because they deserve more money,” said Stonewall Jackson Middle School student Braycen Foster. The West Virginia teachers strike was believed to be the longest one in the state’s history. Some parents had a more difficult time with the restart because the 13-day layoff helped them bond more with their kids. Nannette Higginbotham had mixed feelings as she said goodbye to her daughter. “I love having her home, but I’m glad they’re getting back to school and getting it over with,” she said. County superintendents now must determine whether to make up the missed time. West Virginia Gov. Jim Justice has asked them to be flexible in their decisions to meet the requirement of having 180 days of school, saying Tuesday that students “have suffered enough.” He wants families to have time for summer vacation and doesn’t want summer feeding programs placed in jeopardy if classes go too far into June. Some superintendents are mulling whether to cut short spring break, typically in late March, although families often have vacations already slotted during that time. At the Capitol on Tuesday, teachers expressed relief and exhilaration by breaking out into song after legislators approved the pay raise bill, which Justice swiftly signed. “I’m so thrilled that it’s over, and that I get to go back to my special ed kids, back to our regular routine, and that we’re going to get some great work done the rest of the school year,” said Melinda Monks, a special education teacher at Bridgeview Elementary in South Charleston. The deal ended a paralyzing strike that shut students out of classrooms statewide, forced parents to scramble for child care and cast a national spotlight on government dysfunction in West Virginia. 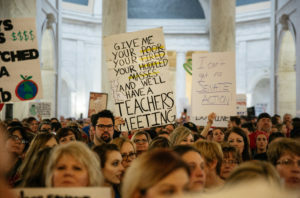 The West Virginia teachers, some of the lowest-paid in the country, had gone without a salary increase for four years. They appeared to have strong public support throughout their walkout. Teachers walked off the job Feb. 22, balking at an initial bill Justice signed that would have bumped up pay 2 percent in the first year as they also complained about rising health insurance costs. Justice responded last week with an offer to raise teacher pay 5 percent — a proposal the state House approved swiftly but that senators weren’t so eager to sign off on. Instead, the Senate countered with an offer of 4 percent on Saturday. Leaders of all three unions representing the state’s teachers held firm, announcing that the walkout would continue, and the lawmakers gave in. The vote for 5 percent raises for teachers, school service personnel and state troopers in the House of Delegates was 99-0. The Senate followed, voting 34-0. Senate Finance Chairman Craig Blair said lawmakers will seek to cut state spending by $20 million to pay for the raises, taking funds from general government services and Medicaid. Other state workers who also would get 5 percent raises under the deal will have to wait for a budget bill to pass. Some students also were eager to return to school after the long layoff. Associated Press writers Robert Ray in Charleston, West Virginia, and Michael Virtanen in Morgantown, West Virginia, contributed to this report.